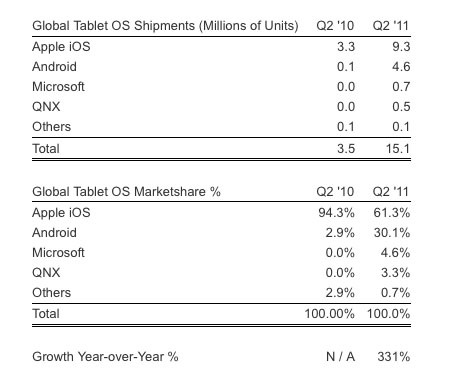 New market share figures for the worldwide tablet market from firm Strategy Analytics don’t have any surprises at the top of the pack: Apple’s iOS dominates global marketshare, with Android tablets in a respectable (but still distance) second place. What’s interesting about Strategy Analytics’ figures is how RIM’s PlayBook is playing out so far: it’s not in third place behind iOS and Android. Instead, it’s in fourth place behind iOS, Android, and tablets running Windows. And these aren’t tablets running a magical time-traveling version of Windows 8 that’s been optimized for tablets: these are tablets running Windows 7, with all the pain that entails. According to Strategy Analytics, Apple’s iPad accounted for 61.3 percent of the global tablet market in the second quarter of 2011, which is down from a stunning 94.3 percent a year ago—but then, a year ago, the iPad barely had any competition. Since then, innumerable device manufacturers have attempted to launch iPad-killer based on Google’s Android platform; however, while those devices now account for 30.1 percent of the market, no vendor has yet introduced a blockbuster Android device that seriously rivals the iPad. However, curiously, Microsoft managed to capture 4.6 percent of the global market for tablet devices in the second quarter ot 2011, with devices running Windows 7. In comparison, RIM’s much-vaunted QNX-based PlayBook managed a 3.3 percent share in the second quarter. 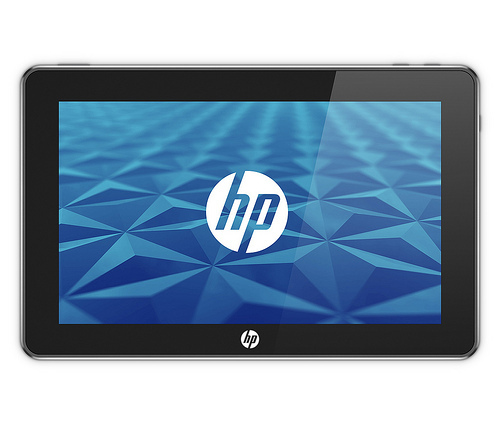 At this point, Windows-based tablets primarily appeal to enterprise and vertical markets rather than consumers; however, those same enterprises are also some of RIM’s biggest customers. Strategy Analytics says that anyone looking to get into the Android tablet market is going to need a truly standout product if they want to succeed.